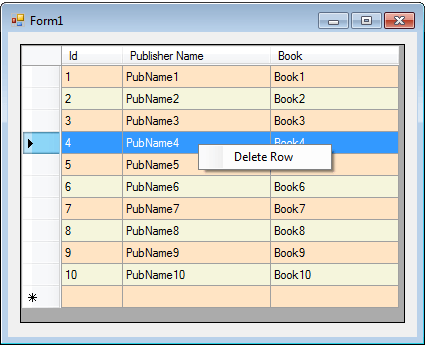 There are many solutions for right click to select a row in a Datagridview and show a menu to delete it. Here we are using CellMouseUp event to select row and contextMenuStrip1_Click event to delete the row from datagridview. The first thing you will want to do is to drag a contextMenuStrip from your toolbox to your form. 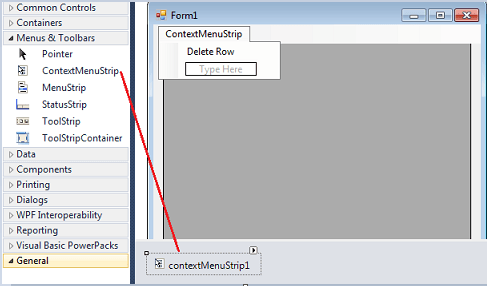 Then you create a menu item "Delete Row" in the contextMenuStrip. The next step is to find the right click row index and show the contextMenuStrip. Here we are using CellMouseUp of dataGridView to indentify the row index and show the menu item. A global variable rowIndex is assigned the row index value for later delete this row. After retrieveing the row index, next step is to delete the specified row. In the contextMenuStrip1_Click event delete the row using rowindex value.